The Extra Class is Free! DID YOU KNOW... UTRGV's in-state tuition and fees cap at 12 hours per semester, which means any additional courses a student enrolls in after 12 hours are free (*see exclusions below). 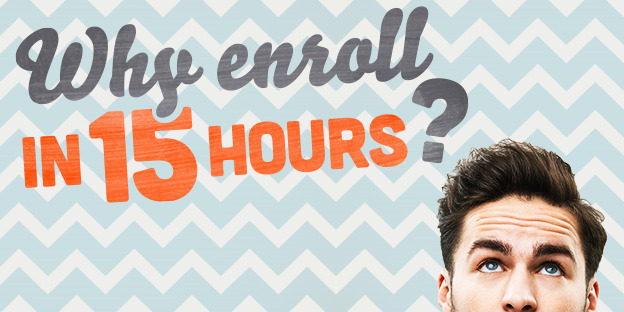 For example, if a student enrolls in 15 hours, the extra class is free. If a student enrolls in 18 hours, the two extra classes are free. DID YOU KNOW... An incoming freshman who started in Fall 2015 and takes 15 hours per semester (excluding summer school) saves more than $7000 compared to a student taking 12 hours a semester, and graduates a full year earlier. All from taking just one more class a semester! DID YOU KNOW... According to Complete College America, students who enroll in 15 hours or more are much more likely to graduate on time than those enrolling in 12 hours or less? The report also states that students who enroll in 12 hours or less are more likely to drop out before graduating than those who enroll in 15 hours. Graduating early means more time to attain an advanced degree, travel or start working full-time. Remember, while we encourage all our students to enroll in 15 hours per semester, some of the benefits above only apply to those students paying in-state tuition. If you have any questions, please speak to your advisor. *Exclusions: books, course/lab fees, repeat/excessive hours tuition, out-of-state tuition, and accelerated online programs.